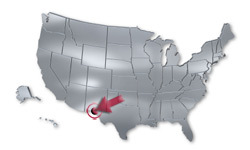 Our central location in the North America manufacturing zone of El Paso, Texas, in the USA and Cuidad Juarez, Chihuahua, in Mexico results in quick turn around times, excellent market accessibility, and low freight expenses. Most importantly, our services are provided by highly trained technical labor at the most competitive prices. The Innovei Mexico facility is located just ten minutes from the international bridge providing easy access to the repair facility from the USA. The Innovei USA facility is located just five minutes from the international bridge providing quick turn-around time from and to El Paso and Juarez. Flight times from El Paso are 1.5 to 3 hours anywhere in the mid and western states and to major manufacturing zones within Mexico. Consequently, we provide same day delivery to 70% of the continental United States.